Many children diagnosed with Autism or Asperger’s Syndrome have challenges with taking in or screening out the sounds, sights, lights, movement, textures or touch from their environments. They may be overly sensitive to some sensations while being under responsive to others. Sometimes the sensory overload will put them into a high alertness state, like a fight or flight response, resulting in meltdowns or tantrums. Sometimes the overload will push them to shut down and withdraw. Occupational Therapy can help children with sensory processing disorders who experience sensory overload. Self regulation is that ability to remain calm across environments and to modulate emotions even when over stimulated, hungry or tired. To keep ourselves with just the right amount of focus and attention for the task at hand, we all use tools and strategies. Self regulation can be especially challenging for children with Autism. OT can help children who need assistance in developing tools and strategies for self regulation that work for them. Occupational Therapy for Sensory Processing Disorder addresses how sensory information is getting in, and it also teaches children to recognize the effects of sensory overload early and to use sensory tools and strategies to regulate attention in a wide range of environments. 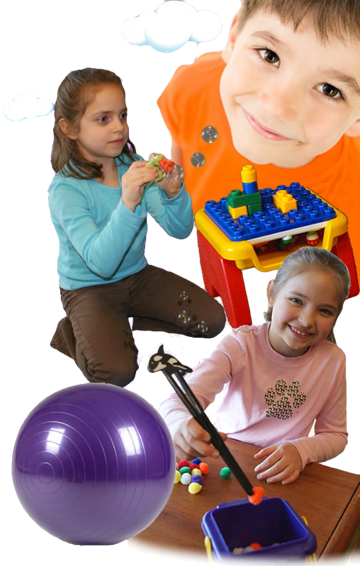 Children engage in play activities that bring together vision, movement, sound and balance to integrate information that comes through different sensory channels (sometimes referred to as Sensory Integration therapy). Children also engage in muscle work activities to help self-regulate attention. Many children with autism are following special diets under the guidance of a nutritional expert. In addition some children with autism are very restricted in the tastes or textures they will eat, or refuse new foods based on how they look. Some children will get stuck on one favorite food for weeks and then replace it with a new singular favorite food, rejecting everything else. Therapy follows a developmental sequence and helps children with overactive gag or under sensitive oral musculature to learn to bite and chew without overstuffing or gagging. Oral motor strategies for straw drinking and blowing blow toys are also used. Food choices are systematically expanded in a supportive setting.